If there were a prize for a space occupied consecutively by the greatest number of restaurants, over the shortest time, 267 Torbay Rd. would be in with a chance. If memory serves, it began as the pizza restaurant, East End Pizza. Then, like a Gallifreyan Time Lord, it regenerated into something more exotic, Rio Brazilian Restaurant. After Rio’s short turn, it became – for an even briefer stint – Chang’s Chinese Buffet Restaurant. Now it’s Doctor Zhou. Err, sorry, I meant Jackie Zhou’s. Bright, big, unmissable red and gold Chinese lanterns hang above the outdoor entrance to Jackie Zhou’s. Inside, the restaurant puts on a more sombre, less celebratory face. 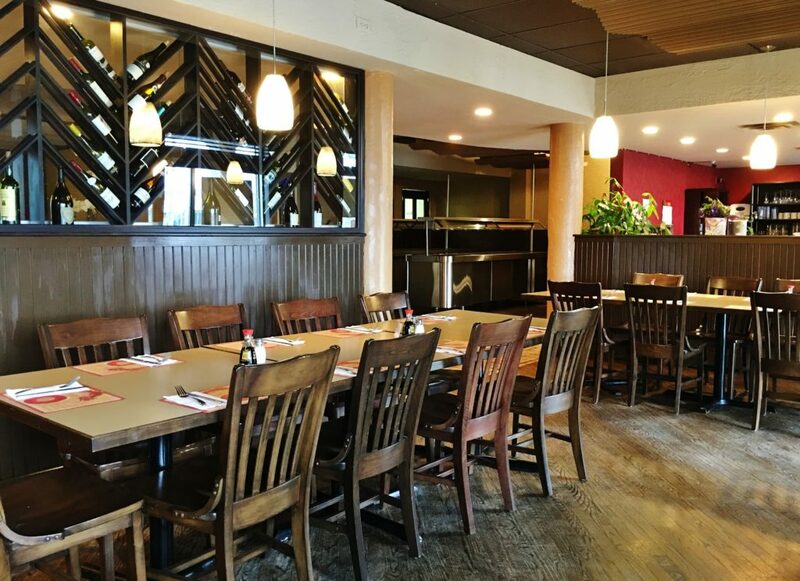 While some walls are red and other parts beige, Jackie Zhou’s is predominantly decorated in dark brown wood, including the floor. If dining in a dusky sanctum is not your thing, I suggest you sit near the front windows. That’s what we did. I’ve always thought fortune cookies should be handed out at the beginning of a Chinese meal instead of the end. The ritual of reading them aloud is usually good for a few chuckles. 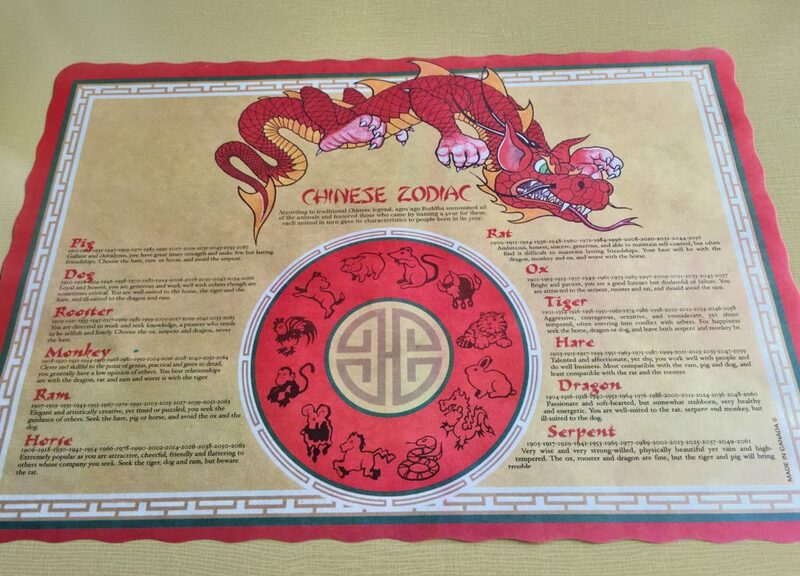 Jackie Zhou’s placemats engaged us from the start. Each outlined the details of the Chinese Zodiac, meaning – based on your year of birth – you could find out which animal you are, your beast’s characteristics and the other critters with which you get along, or don’t. Companion discovered she’s a dog. I’m a serpent. Yes, yes, I’m a serpent, and please don’t say you always suspected as much. According to the description my friend is “loyal, honest, generous and works well with others.” Yup, she’s a candidate for sainthood. And me? It – the Chinese Zodiac – says that I’m “very wise and very strong-willed, physically beautiful, yet vain and high tempered.” I’ll say no more, except, apparently, I don’t get along very well with tigers and pigs. Well, c’mon, who does? We were unrestrained in ordering. Like two famished lager louts after four hours on George Street. I wanted to try as many different dishes as possible and figured any leftovers could easily be packaged to take home to our respective spouses. First up was a pot of Chinese green tea, which is the only green tea I like, and only in Chinese restaurants. Its subtle flavour appeals. 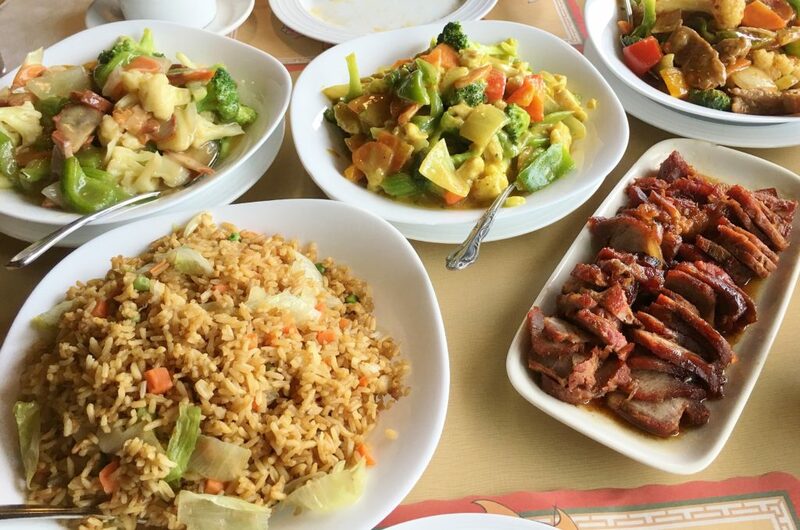 No surprise that Chinese tea pairs well with Chinese food. It’s less green than Japanese green tea, and main brands I’ve bought in supermarkets. 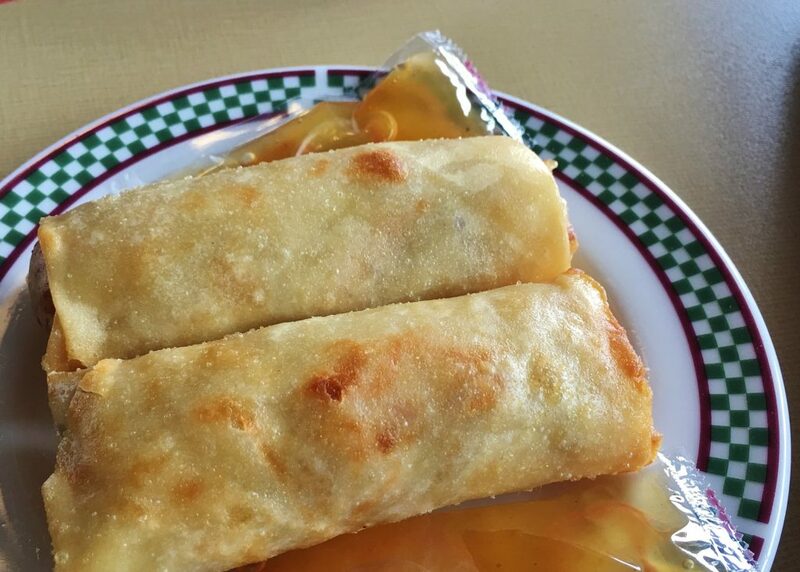 Jackie’s spring rolls were like plump sausage rolls. No, better to say plump cabbage rolls since they were jammed with slivers of buttery Chinese cabbage and not much of anything else. 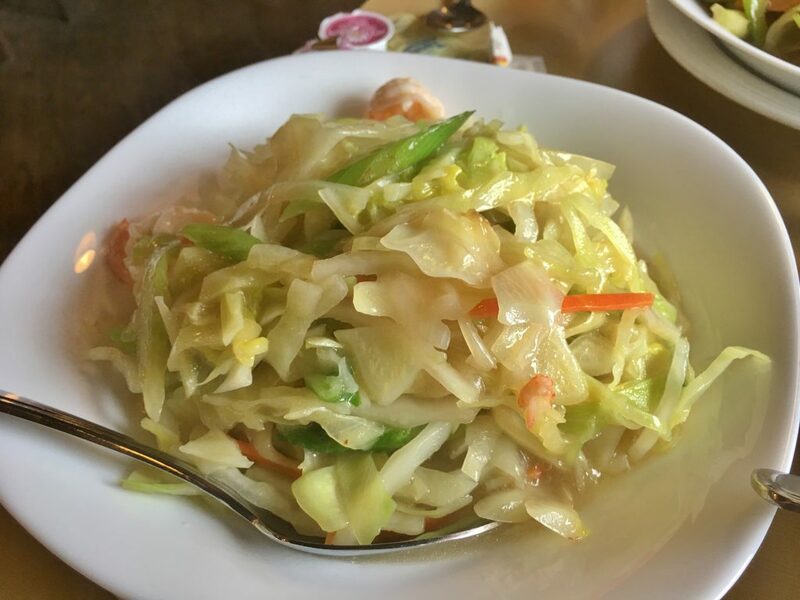 Keeping it simple was fine, because the cabbage tasted fresh and good. In fact, everything we tasted had a remarkable freshness about it. A rectangular plate with two rows of roseate tinged BBQ pork slices looked unctuous. Slightly sweet and salty, the pork was a little dry at the edges but fat and marinade compensated for the dryness. The sliced loin also tasted of what I think was Chinese five-spice powder. 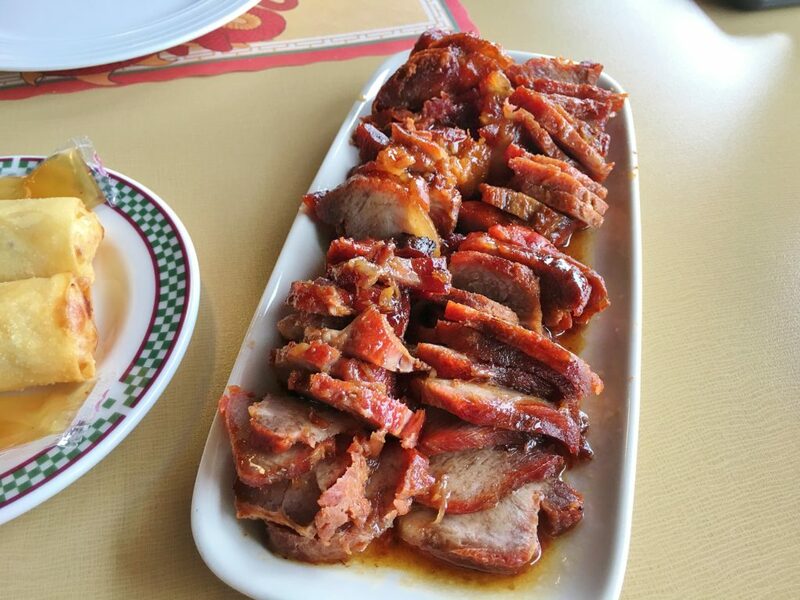 In the event any of your slices are not eaten, Jackie’s pork slices would make a great leftover for sandwiches. Just so you know, Chinese curry isn’t like the curry you get at India Gate. It never was and never will be. Chinese curry contains curry powder instead of a variety of individual spices. There may be some additional turmeric or chili powder added, but the primary seasoning is the tried and true ingredient of many a homemade Canadian curry, a spoonful of good old yellowish supermarket curry powder. 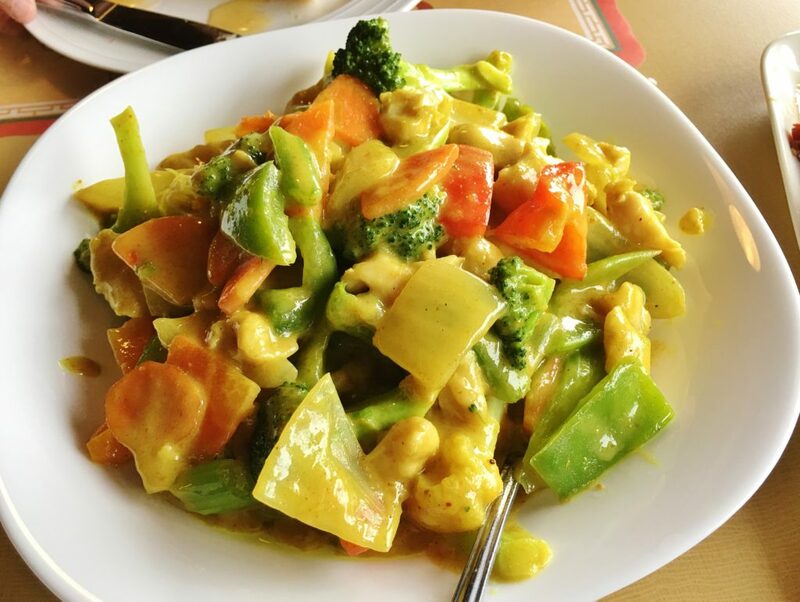 Jackie Zhou’s curried chicken with vegetables tasted as mild as its sunrise yellow cast indicated. Along with chicken, it contained: cauliflower, broccoli, sweet peppers, onion, celery and carrot. Like all of Jackie Zhou’s dishes, it was cooked with skill; and although it lacked the appealing pungency of a more complex curry, this Chinese curry benefited greatly from the flavours of many fresh ingredients. Like the tame curry, Jackie’s beef Szechwan was listed as “hot and spicy.” It had some kick but certainly not enough to thrill or bother. I found the labelling of Jackie Zhou’s dishes to be problematic. The chow mein wasn’t really chow mein and the beef Szechwan was mostly another version of the previous dish without the curry spices and chicken. In other words, the veggies dominated. Beef Szechwan should be beefy. After all, it wasn’t labelled, beef with vegetables. A few vegetables – maybe celery and onion – is fine. But the dish should have been, overwhelmingly, dark, deeply flavourful, spicy beef. In conclusion, I’ll pass along a cute little tip I learned from the table I was fortunate enough to sit with at the Learning Disabilities Association’s “Blind Date with a Star” event last month. We managed to snag a Chinese dinner for the evening. At the end, before we’d begun to crack open the fortune cookies, someone said, “Each person read his or her fortune out loud and then add the words, ‘when in bed,’ to whatever it says.” If you use this tip, I’m confident hilarity will ensue. Price Dinner for two with beverage, tip and tax costs approximately $60. Atmosphere Dull. This space could use some cheering up. 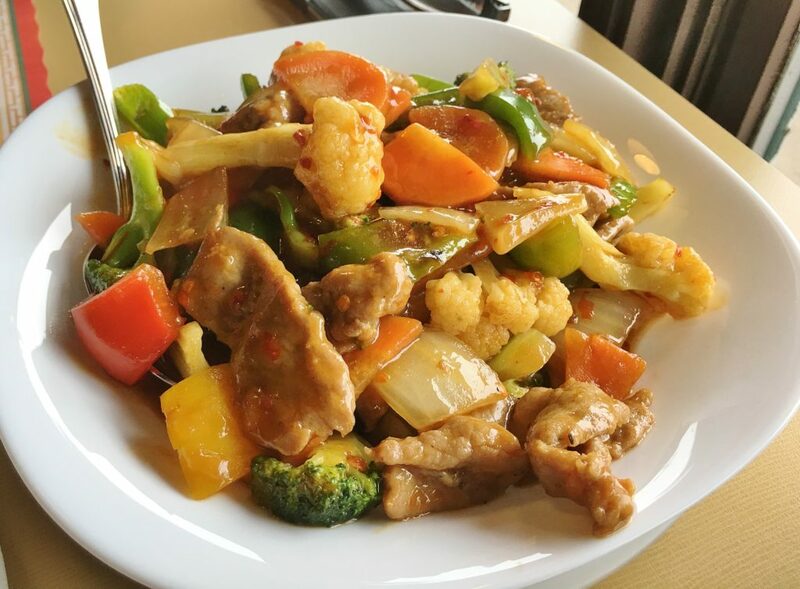 Open Sunday: 12 p.m. to 9 p.m. Monday to Thursday: 11 a.m. to 9 p.m. Friday and Saturday: 11 a.m. to 10 p.m.
Best bets Spring rolls, BBQ pork, Chinese curried chicken with vegetables. Wheelchair access Assistance may be required at entrance.